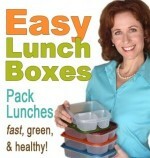 Expert from EasyLunchboxes.com explains how to make lunches your kids will love! As kids return to school, moms are looking for ways to make lunches fun! From cool lunchboxes to hot foods and cold drinks, there are thousands of new technologies, products and creative suggestions to make food more appetizing for kids. Kelly Lester, the creator of www.EasyLunchboxes.com is a mother of three and an expert on school lunches. She says she created EasyLunchBoxes because of her innate ability to do things efficiently while on a shoestring budget. You start by providing nutritious choices that the kids will actually like. Mini Babybel® cheese is a great example, because it’s the real, 100% natural cheese with a rich and creamy taste that all ages adore. Plus, Mini Babybel cheese is the perfect, fun choice for a packed lunch or to enjoy as a snack! Again, Mini Babybel is a good example providing nutritious snacks and sized just-right, so the whole family can experience an everyday snack packed with the nutrients you and your family need. Each small but mighty serving of Mini Babybel delivers 5-6 grams of protein, plus 15% of your daily calcium needs. I believe in providing plenty of fruit for my kids. I’m from California, so here’s my tip. California Raisins, they are an all-natural, dried-by-the-sun fruit you can feel good about sending with your kids as they head back to school. The ingredient list says it all: Raisins. They are also convenient and portable, which makes California Raisins a great choice for wholesome, healthy, on-the-go snacking. California Raisins come by their sweetness naturally. With raisins, the nutrition label tells a great story: zero fat, no cholesterol, no added sugar, plus fiber, potassium and iron, too. Research suggests that among children, eating raisins as an after-school snack may prevent excessive calorie intake and may increase satiety when compared to other common snacks. For easy-to-make, healthy snack ideas kids will love, we have 5 new recipes using California Raisins. These snack mixes like Honey Nut Raisin Snack Mix and Crunchy Cinnamon Mix are really tasty and healthy and best of all, ready for lunch boxes, backpacks, your purse, or car.